If you’re looking for a fun holiday dessert the entire family will enjoy, we’ve got the perfect treat for you! Today, we’re sharing a sweet, new twist on a classic ice cream favorite that’s sure to spread some holiday cheer. 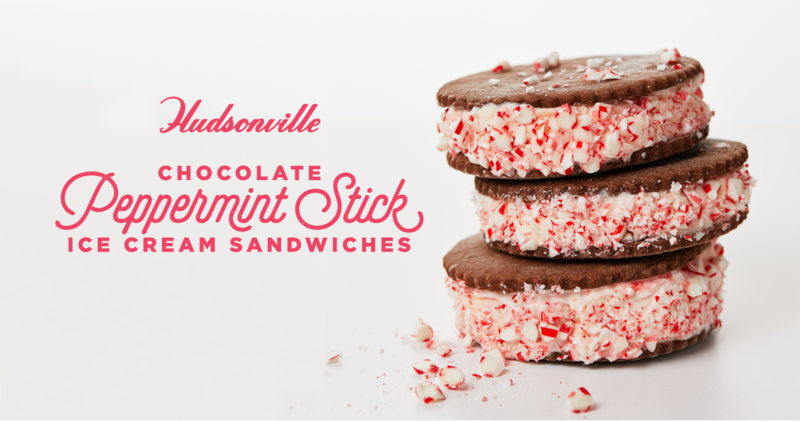 These Peppermint Stick Ice Cream Sandwiches are delicious and super easy to make. Simply follow the recipe below and share your sweet creations with us on social media. In a small bowl, sift together flour and cocoa; set aside after adding in salt. In another bowl, mix butter on medium speed until fluffy (about 3-5 minutes). Mix in sugar with butter on medium speed until combined and very lightened. Add in flour mixture; mix on low speed until just combined and dough sticks together when squeezed. Shape dough into a ball and wrap in wax or parchment paper; chill until slightly firm. Roll out dough to ¼ inch thick. Cut into cookies using a 3-inch round cookie cutter. Preheat oven to 325 degrees. Place and space out cookies on baking sheet lined with parchment paper. Bake cookies until firm (17 to 20 minutes). Transfer cookies to wire rack to cool completely. Meanwhile, scoop small balls of ice cream into electric mixer bowl (mix 2 minutes to soften). When cookies cool, put a scoop of ice cream on a cookie and place second cookie on top. Roll cookie sides in crushed peppermint candy canes; freeze about 1 hour. Then enjoy!